together, it is known as "tandem" surfing. People have also helped enable dogs,cats, pigs, rats, and mice to surf using boards. Remote-controlled and non-controllable toys such as the Micro Surfer and Mini Surfer can also ride waves. design, including surfboard length, riding style, and the kind of wave that is ridden. In tow-in surfing (most often, but not exclusively, associated with big wave surfing), a motorized water vehicle, such as a personal watercraft, tows the surfer into the wave front, helping the surfer match a large wave's higher speed, which is generally a speed that a self-propelled surfer cannot match.Surfing-related sports such as stand up paddle surfing, paddleboarding and sea kayaking do not require waves, and other derivative sports such as kitesurfing and windsurfing rely primarily on wind for power, yet all of these platforms may also be used to ride waves. Recently with the use of V-drive boats, wake surfing, in which one surfs on the wake of a boat, has emerged. 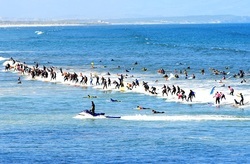 Pictured: The wave on which 103 Cape Town surfers broke the Guinness World Record for the ‘most surfers riding the same wave’ at Earthwave in Muizenberg, Cape Town.